Source: Purchased from Barnes and Noble. My second foray into eBooks using my new Nook Color was this collection of short stories by another favorite crime fiction author, J.A. Jance. 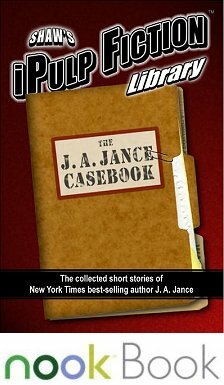 The "casebook" is a collection of eight stories written by Jance from 1994 to 2005. One story, "Second Fiddle," stars a Jance regular, J.P. Beaumont, but the rest do not feature any characters from her series books. As is usual with collections, I like some much more than others, although I will say that there is something to enjoy in all of the stories included here. "Oil and Water" features two police officers-- one a female who'd suffered spousal abuse in the past, and the other an unrepentant misogynist-- who've been called out to the death of a woman... whose husband is the prime suspect. "Death of a Snowbird" is about an older couple from Illinois who winter in the Southwest every year. For years, the woman has deferred to her husband in everything... until the day her husband brings home an ancient clay pot he found out in the desert. Although somewhat painful to read, I love determination and the intricate workings of the mind of the woman in "A Flash of Chrysanthemum." A victim of Lou Gehring's disease, she has only the use of one big toe... and a labor of love to try to perform. "The Duel" involves two people who are convinced that the other is trying to kill him, and their friend, Howard, who has to walk a fine line between them. I love the twist at the end! My absolute favorite is "Signore Blanco" about a feisty little dog named Snowball (see why he prefers to be called Signore Blanco?) who lives in Venice and likes to make bets with his friends as to which drunken tourists will fall into the canal while getting into the gondolas. One day, however, Signore Blanco sees a young woman and an older man at his favorite restaurant-- and something just isn't right. Can Snowball really be a hero under all that fur? Read it and see! This is a fun collection of well-written short stories. If you have the chance to get your hands on them to read them, please do. You'll enjoy them! The J.A. Jance Casebook at Barnes and Noble. The J.A. Jance Casebook at Amazon. Thanks for the heads up. I just linked over and bought it. I'm thinking it will be a good introduction to the author. Mary-- They will be a good introduction, but I definitely prefer her books! Margot-- I've never been much of a fan of short stories, to be honest. I've been using them as an introduction to my Nook and have come to realize that I've been giving the genre short shrift for many years. I should try short stories, I know, but there are just too many books I want to read. Barbara-- I feel the same way, but I did enjoy my small foray into the genre.